Attention Dr Pepper Collectors!!! 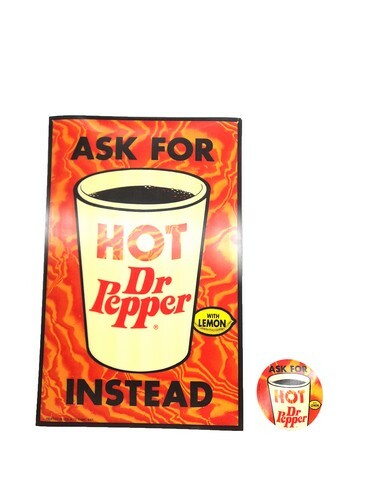 Ask for Hot Dr Pepper with Lemon Instead sign and pin on button!!! This one is very unique and one I don't think I have seen before. It is New Old Stock (NOS) and it is made of a very thin plastic which has some form of a 3D effect to it and is in near mint to excellent condition. The sign has two premade hanging holes in the upper left and upper right hand corners. Each sign may have a very, very small chip at one or more of the four corners. At the bottom left corner it says "Printed in USA 9/72 THINC 845. It measures 17 inches tall by 11 inches wide. The button measures 3.5 inches across. If you need more pictures or have questions, just let us know.